Should Christians judge? Jesus commanded men to judge rightly and He told them to judge not. Did the Lord contradict Himself? Or does the Bible say more about judging than Christians are generally taught? Don't judge? But Jesus repeatedly taught men to judge rightly, insisting they "judge with righteous judgment" (John 7:24) and He praised a man who "rightly judged" (Luke 7:43). Paul shamed the Corinthian Christians because no one among them was willing to "judge the smallest matters" (1 Cor. 6:2). As the Apostle wrote, "He who is spiritual judges all things" for "we have the mind of Christ" (1 Cor. 2:15-16). Where did we get the notion that men should never judge? Should child-molesters escape condemnation? Should rapists be free from criticism? Should society refrain from judging those arrested for murder? Why would anyone judge others for judging? And if a pastor teaches "don't judge" regarding abortion and homosexuality, what would he say about a parishioner who doesn't donate but rather takes money out of the collection plate? A lie has partially paralyzed the church. God warns against "hypocrisy" commanding men to "abhor what is evil" (Rom. 12:9). Yet to abhor evil, someone must first judge evil. Thus, unable to judge, large numbers of Christians become hypocrites by obeying the Hypocrites Golden Rule. Since the hypocrite doesn’t want to be judged, he judges not, as Jesus said, "Judge not… you hypocrite" (Mat. 7:1, 5 KJV; Ezek. 16:52). For "judge not" (Mat. 7:1-5) is simply a hypocrites application of do unto others as you would have them do unto you (Mat. 7:12). “For with what judgment you judge, you will be judged” (Mat. 7:2). Judge others as you would have them do unto you inverted is Judge not if you do not want to be judged. Christ kept repeating this theme in His ministry. "Hypocrites," Jesus said, "why, even of yourselves, do you not judge what is right?" (Luke 12:56-57). Still, His own followers have mostly ignored the Lord’s harsh rebuke: "Hypocrite! First remove the plank from your own eye, and then you will see clearly to [judge, i.e., to] remove the speck out of your brother’s eye" (Mat. 7:5). "Judge Not" is the Hypocritical Oath. "Judge Not" is hypocrite haven. He who lives in a glass house should not throw stones. Such Christians should relocate. They should move into "the temple of the great God… being built with heavy stones" (Ezra 5:8). Christians live in the "building" for which Christ is “the chief corner stone” (Eph. 2:20). And if that Stone falls on someone it "will grind him to powder" (Mat. 21:44; Luke 20:18; cf. Ex. 32:20). Better to be judged by a Christian than crushed by Christ. As Paul wrote of the man who "keeps the righteous requirements of the law" that he will "judge you who... are a transgressor of the law" (Rom. 2:26-27). Hollywood, Hillary, and Homosexuals repeat the phrase like a mantra, judge not, judge not, judge not, until the masses are mesmerized. Jesus did not intend this. Scripture deals with topics that range from simple to advanced truth. Milk is for babes in Christ; meat is for men of God. The question of whether or not Christians should judge is milk. It is preschool. The newest believer taught any of a hundred passages would immediately understand that he must judge. Judging others is fundamental. It is not a difficult concept and should in no way be controversial. "Everyone who partakes only in milk is unskilled in the Word of righteousness, for he is a babe" (Heb. 5:13). 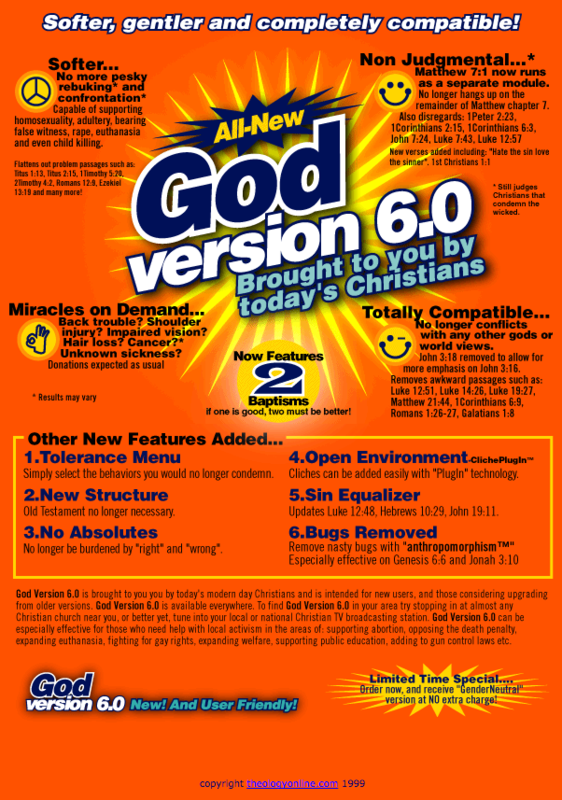 Today the Church is lactose intolerant and has trouble even with milk. Extreme ignorance of the Bible has crippled the Church. And that paralysis slows every denomination by hurting local fellowships. What is the percentage of Christians who have succumbed to the "Judge not" deception? Is there even one percent of believers who have not fallen for that diversion? 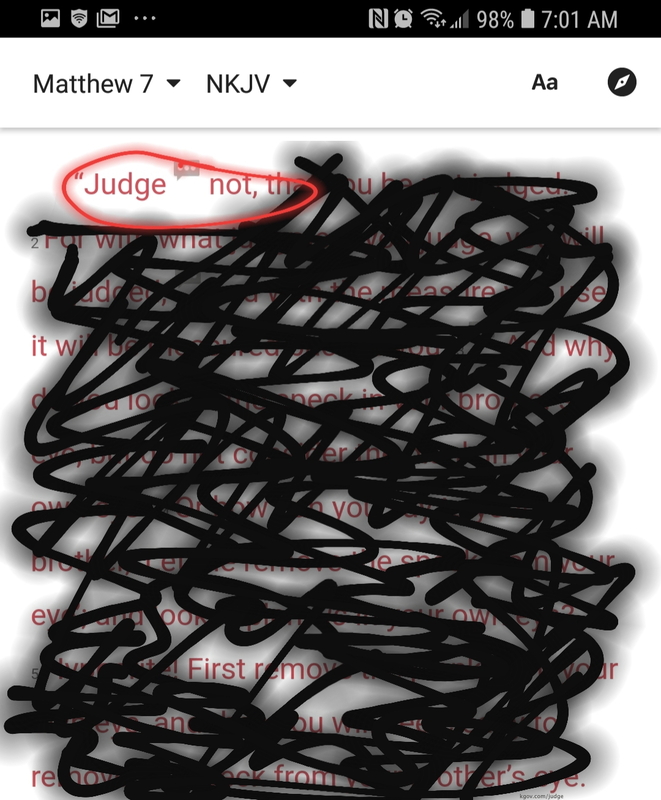 A quarter century of observation suggests to this author that probably 99 out of 100 believers misquote Jesus by repeating the "Judge not" mantra. Believers need to turn from this sin and ask God for wisdom to keep from being so easily deceived again. Curse God and die! Is that good advice? Word for word, it is in the Bible. Job’s wife counsels her husband to "Curse God and die" (Job 2:9). Many verses, if ripped out of context, can ruin lives. Judas "went and hanged himself" (Mat. 27:5) and as Jesus said "Go and do likewise" (Luke 10:37). The believer who lacks a hunger for God’s word is susceptible to the most absurd dangers. An October 1996 letter in Denver's Rocky Mountain News expressed a typical judge-not sentiment. It advocated incarceration and not the execution of murderers, who are made "in the image of God" as it would be "wrong to put the image of God to death." However, the writer never addressed the incongruity of putting the image of God in jail. "Judge not" is the prayer of those who want to hide light under a basket. The cliché describes salt, which has lost its flavor, which no longer seasons or preserves. This seductive lie takes its victims out of ministry. As spectators on the sidelines, they only watch the spiritual battle. But they are in a comfort zone. Apathy is the craving. "Judge not" is the shirking of responsibility. Do you not know that the saints will judge the world? And if the world will be judged by you, are you unworthy to judge the smallest matters? Do you not know that we shall judge angels? How much more, things that pertain to this life? I say this to your shame. Is it so, that there is not a wise man among you, not even one, who will be able to judge between his brethren? Secondly, regarding the perspective of judging those inside the church as compared to those outside, Paul contrasts the two to make clear our greater obligation. Because the Bible so often presents godly believers as judging unbelieveres, some students at first assume that there is a contradiction between this passage and those others. We know, however, that the Bible teaches a cohesive message that does not contradict itself, including regarding judging. Therefore, the tension is only apparent and it should have a simple resolution. We must love our mother and father (1 John 4:11; Mat. 19:19; Romans 13:9; etc.) yet Jesus says that we cannot be His disciple unless we hate our father and mother (Luke 14:26). This easily understood Hebrew figure of speech teaches perspective. To the degree that you love Christ, it is as though you hate your own parents (search for: "hate his father" using Ctrl-F in this BEL debate). Likewise, compared to the extent of our obligation to judge fellow believers, it is as though we could ignore those outside of the church. (But of course, just as we wouldn't hate our parents, likewise, to not judge those outside the Body would be to hate them.) Similarly, Jesus focused on teachings about life within the kjngdom yet John the Baptist was right to publicly rebuke even Herod, that unbelieving king (Luke 3:18-19; etc.). So yes, we judge the world, because we love the world, but far more importantly, believers judge one another. Returning though to 1 Corinthians 6, notice that even spirit beings will submit to the judgments of believers. “Do you not know that we shall judge angels?” Then and now, believers should “judge... according to My judgments” (Ezek. 44:24) as God said. The Almighty commits judgment into the hands of His obedient servants (Rev. 20:4). If God were the only judge, the sins of all men would be “clearly evident, preceding them to judgment” (1Tim. 5:24a). But because human beings will judge their fellow men on Judgment Day, therefore the sins “of some men follow later” (1Tim. 5:24b). The human judges will already have been aware of the sins of notorious men. But they will not learn of the sins of obscure men until they are revealed at Judgment Day. Also, these human judges will then become aware of the sins of leaders, celebrities, and even family members who had carefully concealed their wickedness. Enoch, the seventh from Adam, may have known of this. For he said “the Lord comes with ten thousands of His saints to execute judgment on all” (Jude 14-15). The Lord with His saints will judge the world! Jesus too said, “The men of Nineveh will rise in the judgment with this generation and condemn it...” (Mat. 12:41). And as Solomon wrote, “jealously is a husband's fury; therefore, he will not spare [the adulterer who violated his wife] in the day of vengeance. He will accept no recompense nor will he be appeased” (Prov. 6:34-35). God gives the responsibility for vengeance, condemnation, and judgment to His servants for “every tongue which rises against you in judgment you shall condemn. This is the heritage of the servants of the Lord” (Isa. 54:17) so "Tell My people their transgression," says the Lord, "and the house of Jacob their sins" (Isa. 58:1). Today, many believers are effectively saying, “Lord, thanks but no thanks. I’ll pass on that judgment duty.” But Paul responds, Start judging now, because you will need the practice (1Cor. 6:2-5). Remember, “He who is spiritual judges all things. For... we have the mind of Christ” (1 Cor. 2:15-16). For as the King James Version quotes Jesus, "ye... have omitted the weightier matters of the law, judgment, mercy, and faith: these ought ye to have done" (Mat. 23:23). And God will reward those who judge, and do the hard work: “Those who rebuke the wicked will have delight, and a good blessing will come upon them.” (Prov. 24:25). Would slain Columbine high school student Danny Rohrbough be forgiving or judgmental toward his unrepentant murderers? A People Magazine photo in Nov. 1999 shows his family and friends answering that question. They quote Rev. 6:10 in which martyred Christians in heaven ask God to “avenge our blood.” Judge-not Christians condemn the martyr’s call for vengeance, but never the murderer. Wormwood: Believers have so many weapons at their disposal. It is difficult to neutralize them. It takes a huge effort just to slow the work of a single Christian. Screwtape: Your one-on-one approach is inefficient. This is the age of Madison Avenue and mass marketing. If you can undermine their whole group at once, then you’ve accomplished something. Wormwood: Unfortunately, I’m not highly productive. In the time it takes me to frustrate one believer, I could tempt a dozen heathens. Screwtape: Don’t lose heart, Wormwood. We are imple­menting a plan to impair the whole Church with a single ploy. Wormwood: I don’t see how that will be possible. I see Christians dedicated to warning others about hell. It’s all I can do just to get one of them distracted for a short time. Screwtape: We are going to use their Leader’s own words. Wormwood: No! Please don’t. Don’t even joke about using His words. I can’t take it. Screwtape: If you’re ever going to grow up to be an effec­tive demon, you’re going to have to learn to use the Enemy’s words against Him. Wormwood: It just seems so dangerous. Which words are you going to use? doing. And I might add, it’s causing me grief. Screwtape: When their Leader said those words, He was speaking to hypocrites. “Judge not… you hypocrite,” as He said later in the same paragraph. Wormwood: Yeah, but how are we going to use “Judge not” to neutralize the whole Church? Screwtape: We’re going to get them to ignore the fact that He was talking to hypocrites. He said that hypocrites should not judge, at least not until they stop doing the wrong deed themselves. But we’re going to make them think none of them should judge, ever. Wormwood: That’s bril­liant… if you can pull it off, that is. I mean, if we can get them to stop judging, then they won’t rebuke the wicked. And they won’t be able to admonish those who are sexually immoral. Screwtape: It is even more brilliant than you realize. If we can seduce Christians into fol­lowing the instructions for hypo­crites, we will turn them into hypocrites. It’s like government workers who follow foolish rules so precisely they are transformed from human beings into bureau­crats; drones who mindlessly dis­pense red tape regardless of the misfortune they cause. The slave who willingly obeys his master, begins to conform to the master. If believers willingly submit to an instruction for hypocrites, they will conform to hypocrisy. Eventually, with a little evil luck, we might stop them from con­fronting unbelievers altogether because, as you know Worm­wood, to confront requires judg­ing. And if they don’t judge un­believers, they are hypocrites, professing the Gospel but deny­ing its power. Wormwood: Ha, ha. I’m excited. When do we start? Screwtape: Everything is underway already. Just do your part. Screwtape: Make sure your targets read as little of the Book as possible. Don’t get too wor­ried if they stick to their favorite twenty cliché verses. But make sure they remain ignorant of most of the Word. Wormwood: Master, you are brilliant. Screwtape: You can call me Master if you want, but don’t let the boss hear you. Hopefully the Church will see Judge Not headed for retirement replaced with Judge Rightly. 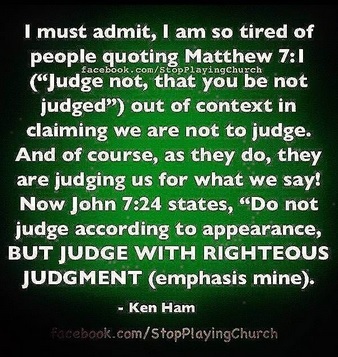 For as Jesus said, “Do not judge according to appearance, but judge with righteous judgment” (John 7:24). And you're invited to listen to Bob Enyart Live which airs around the world via the Internet 24/7 on KGOV.com and throughout Colorado on the 50,000-watt AM 670 KLTT weekdays at 3 p.m. Also, you can get The Plot, Bob’s best-selling book about the Bible at our KGOV store or by calling 1-888-8Enyart (836-9278)! And there's a somewhat vigorous discussion of the principles of judging rightly as regards the pro-life movement on Jill Stanek's blog.